I'm currently putting together a little project that requires me to connect a switch, motor and power supply in series. If it was a permanent thing, I'd use a terminal strip and screw the wires in, but in this case I want to use some of the parts in other projects, so I decided to use connectors on everything. Putting connectors on the devices themselves isn't a problem, it's just that you need an adapter of sorts to connect everything together. 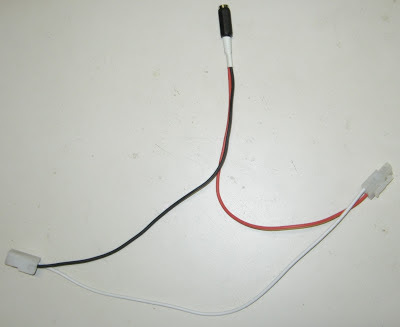 So with what I had on hand I came up with this cable harness. I use the term harness loosely as there are only three wires and three plugs. There isn't anything complex going on here, just daisy chaining three parts, but it's the finishing touches that make it more usable. By folding the wires together and adding some cable ties the harness becomes more compact and gets some strain relief. To finish things up and make it a little neater, throwing a bit of heatshrink over the cables is a nice touch. The heatshrink covers the sharp bits on the cable ties and also helps to keep the them from moving around. This means you haven't got to ridiculously tighten the cables ties, as long as they're firm they'll be fine. I've left an inch or so of wire protruding from the heatshrink, this makes it easier to connect to the incoming cables that may come from different directions. I love heatshrink, I always keep a reasonable selection on hand. It can help make an average looking job just a little bit more professional. A quick tip, printing room names and sliding them under bits of clear heatshrink on network cables is a great way to identify cables when doing a home network installation. It gives nice results and you'll never get cables mixed up again.